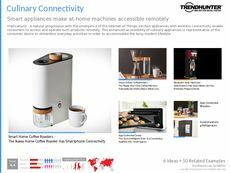 Find Better Ideas, Faster ® with a custom compact kitchen trend report, our PRO Dashboard and 80+ categories of premium trend reports. 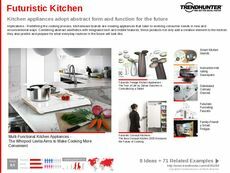 The Compact Kitchen Trend Report focuses on the maintenance of having a small, but fully functional kitchen. We show readers new and innovative appliances as well as kitchen designs that incorporate built-in features opposed to add-ons. 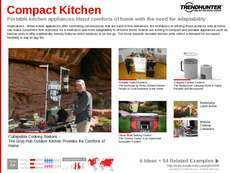 There is a specific analysis that highlights new housing developments, mobile homes and down-sized accommodations that are able to maintain all kitchen necessities within tiny spaces. This report will help housing development companies and architectural designers to create modernized houses and abodes that are able to carry all require kitchen items, within a much smaller building space. 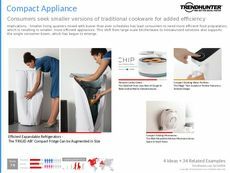 Kitchen appliance creators and retailer supply stores can also benefit from the information contained in this report that relays vital consumer information and current industry trends. 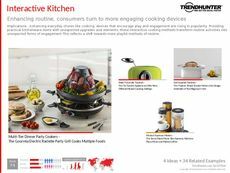 The Compact Kitchen Trend Report will help you and your brand design modern kitchens and kitchen accessories that will benefit consumers living in smaller dwellings.